Need to turn a cramped, outdated bathroom into a luxury oasis? Want to take that large bathroom and improve its functionality? Talk to the experts at ProSource® of Bloomington about how we can help you design a bathroom you will love. Whether you are working within a strict budget or you have a green light on luxury options, we have something to match your needs. Come browse our extensive showroom and find the perfect bathroom remodeling products. Rip out that old, stained sink and replace it with a new, gorgeous basin. 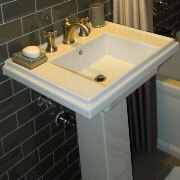 We carry bathroom sinks in a variety of styles and materials. 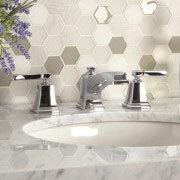 Opt for a modern stone slab sink for a sleek look or choose an ornate basin for a classic space. Every little touch adds to the design of the overall room. When you shop at ProSource of Bloomington for bathroom remodeling products, don’t forget to browse our top-brand bathroom sink faucets to add the perfect finish to your design. Do you want a luxury shower with a rain-style shower head? Or perhaps you are in need of a removable shower head with a hose. And don’t forget the shower door and base. Either way, we carry the showers you need to help build a dream bathroom. 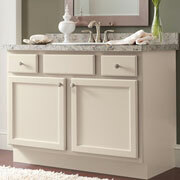 Add a touch of class and luxury to your bathroom remodel with a stunning vanity. From large vanities with plenty of storage space to smaller units better suited to tighter spaces, we provide premium vanities at wholesale pricing. 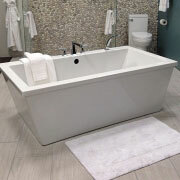 Whether you hope to relax in a deep, stand alone tub or you want to add a unit that makes bathing the kids simple, we can find the right style and model for your needs. Shop our wholesale tubs today. 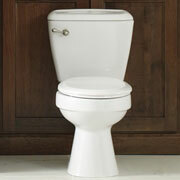 Flush away the days of jiggling handles and wasting water when you upgrade the toilet. Browse the brands you know and trust at prices you will love. We are proud to serve the greater Bloomington, Minnesota area. The ProSource of Bloomington showroom is conveniently located in Bloomington, Minnesota and serves all of the neighboring cities including Belle Plaine, Burnsville, Cannon Falls, Carver, Castle Rock, Claremont, Cleveland, Dennison, Dodge Center, Dundas, Eagle Lake, East Ellsworth, Eden Prairie, Elko New Market, Elysian, Faribault, Farmington, Frontenac, Gaylord, Goodhue, Hampton, Henderson, Hope, Janesville, Jordan, Kasota, Kasson, Kenyon, Kilkenny, Lake City, Lakeville, Le Center, Le Sueur, Lonsdale, Madison Lake, Mankato, Mantorville, Mazeppa, Medford, Mendota, Minneapolis, Minnetonka Beach. Montgomery, Morristown, Nerstrand, New Prague, Nicollet, Northfield, Owatonna, Pine Island, Prior Lake, Randolph, Red Wing, Rosemount, St. Paul. St. Peter, Savage, Shakopee, Wanamingo, Warsaw, Waseca, Waterville, Webster, Welch, West Concord, Winthrop, Zumbro Falls and Zumbrota.